Now I know I'm definitely back home, getting things back to normal - I did an almost full-day movie marathon today, watching Winnie the Pooh, Captain America and The Smurfs. I probably could have squeezed in Transformers 3 (yes, I'm totes late on that one), but I didn't have it in me to fork over another $17 for a 3D movie. Oiy. Pricing's gone nuts up here! I think I bought this magnet at one of the Comic-Cons, or maybe even Forbidden Planet down at Union Square, but I remember when I bought it, I was all excited about the movie coming out this year. I was kinda disappointed today. True to form, I fell asleep during a pretty important part - well, important to my sister, anyway. She's been waiting on Captain America because her boyfriend Richard Armitage was in it, and only for like 10 minutes. I totally missed about eight of those minutes. Oops. I know, ridiculous to wake up and see cute Richard Armitage running away from Chris Evans. I'm sure I'll have to watch the RA sequence over again, probably with DCsis - whose birthday is today - Happy Birthday! But it wasn't just that sequence - I fell asleep again, and woke up to Steve Rogers fronting the USO...and at that point, I figured you know what? Maybe I should just leave, and catch the earlier showing of The Smurfs at the next theatre. Then Steve Rogers had to go and save his BFF and 400 POWs. I'm also glad, because it did remind me also that I totally forgot to see Thor in the theatres earlier this year. Yep. I need to get on that. 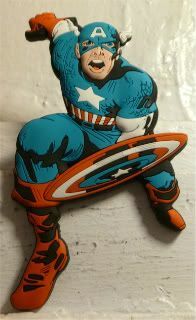 Awww, I liked Captain America, maybe as much as I liked Thor. But then I love these kinds of movies. Since when do you drink beer? Joy, what was it like for the Bicentennial?